Scarlet Day of Service is the one of the largest service events of the year at Rutgers University planned by the Rutgers University Programming Association (RUPA) and Rutgers Student Affairs. 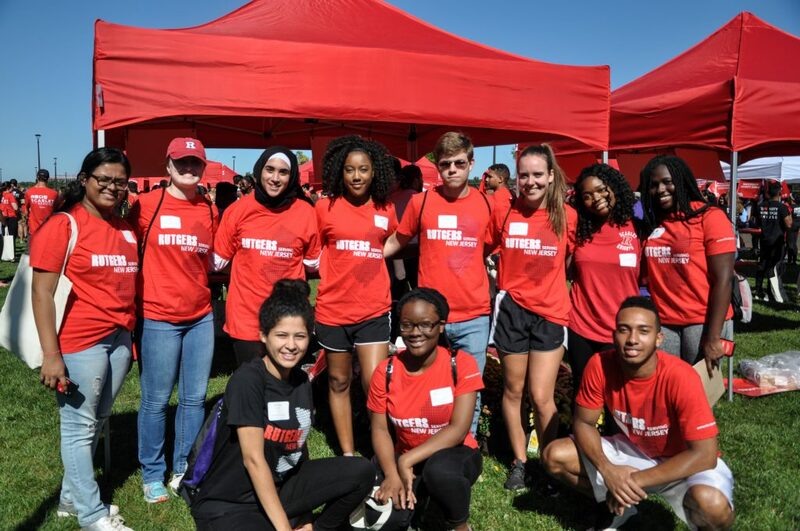 On this day, students and alumni come together as part of the State University of New Jersey to volunteer at different community organizations throughout central New Jersey. Scarlet Day of Service will be held on Saturday, March 30, 2019. This event provides over 500students and alumni the opportunity to serve New Jersey by cleaning up communities, revitalizing outdoor spaces, working with youth and senior citizens, and more. Students must register prior to the event to participate. On Scarlet Day of Service we aim to serve throughout the state of New Jersey and provide students an opportunity to give where they live and make meaningful connections with the community. Students can sign up as individuals or in groups. Students who register by March 25 will have the opportunity to choose their site in advance of the event, otherwise, will have a chance to sign-up for an available site with your group or individually. Transportation, breakfast, lunch, and a T-shirt will be provided to all students. Individual registration opens on March 5, 2019 at getinvolved.tix.com. Alumni can register here. Have one representative register the group (min. 5 students, max. 20 students) at this link and include a roster of group names. The person who signs up the group will be the first Site Leader for the group. Groups may be required to have more than one Site Leader who are all required to attend a training on Saturday, March 30 at 8:00 am at the Graduate Student Lounge at the College Avenue Student Center. When individual registration opens on March 5, all members of the group will need to individually register at getinvolved.tix.com. Any changes to the group roster must be emailed to rupacommunityservice@gmail.com by Thursday, March 14. Students will meet at Morrell Street at 9:30 a.m. to check in. All student volunteers are required to commit to participating in the full event from check in at 9:30am until their service project is complete. Ending times vary based on the location and project. After registration, all volunteers will be bused to the sites or will walk to the sites and will not be permitted to drive themselves. We encourage students to take the bus to the College Avenue Student Center bus stop and walking to Morrell Street. If you choose to drive, students must park only in lots they are authorized to park in. We will provide you with a Scarlet Day of Service t-shirt. Please wear old clothing and sneakers. Various activities for Scarlet Day of Service may include outdoor work, painting, and other activities in which your clothing will get messy. 1. All students should bring their own reusable water bottle. We will have filling stations at the event. 2. If there is a certain site you have you heart set on visiting, we suggest you register early or we suggest that you arrive early since some of the smaller sites fill up quickly. Site Leaders are students who are responsible for a group of 10-15 of their peers on the day of the event. Site Leaders guide students to and from the site location, manage contact with RUPA, site location, and bus driver, and lead reflection after the training. All Site Leaders are required to come to a mandatory training the morning of the event at 8AM. Confirmed Sites for Spring 2019 are listed below. If you have questions about any of the sites, please contact rupacommunityservice@gmail.com.